The eBook recently published by Strategic Systems Group (SSG) is an FAQ resource. 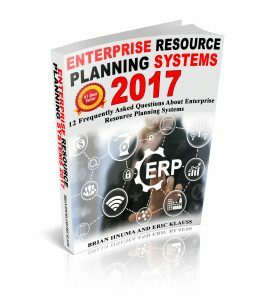 It provides in-depth answers to “12 Frequently Asked Questions about Enterprise Resource Planning Systems” for manufacturers. In Chapter 11, we explore the Internet of Things (IoT), its role in and its impact on ERP systems in general, and specifically in manufacturing. The IoT is a vast network of connected, embedded devices and sensors that produce, relay and share actionable data. How vast? It’s anyone’s guess. But experts estimate that there were more than 8 billion such “things” at the end of 2017 and that there will be more than 30 billion by 2020, just 2 years from now. Even if those estimates are exaggerated, clearly the IoT is a force to be reckoned with. Web-enabled devices and sensors enhance the ability of ERP systems to generate real-time reports on various location- and status-related issues. Where does a specific part reside in a warehouse? Where is it in the manufacturing process? Imagine just being able to look at a screen and provide accurate answers to those questions with a mere click or two. “Smart” devices enable “smart” manufacturing and “smart” ERP systems. You can download a complimentary copy of our eBook now, or just read on. Here are just a couple of examples from the aerospace industry to better illustrate how the IoT in ERP and manufacturing can work to everyone’s advantage. This is an area that offers one of the most obvious opportunities for IoT in manufacturing today, as there is often an immediate competitive advantage as well as a financial benefit to be gained by organizations that embrace IoT. Let’s look at a company that provides heat testing and treatment services for the aerospace industry. Their customers wanted real-time data about the performance and status of its components, pieces of equipment that were heat treated and then tested in giant furnaces. By embedding sensors in the furnace and the parts being tested, this company is able to provide minute-by-minute, degree-by-degree reporting to their aerospace customers. Aerospace companies are very stringent about record keeping, especially if there’s an ISO 9001 or some other compliance requirement for quality. Compliance requires superior record-keeping regarding, for example, how the testing process went or the parameters of the heat treatment process as described above. Those records had to be kept on file for a lengthy period of time – at least as long as the lifespan of the aircraft. In times gone by, general contractors like Boeing and Lockheed Martin were responsible for that record-keeping. Today, much of that responsibility has been pushed down to subcontractors for whom such record-keeping can present a major challenge. But with IoT sensors recording the data and ERP systems storing that data, the challenge can much more easily be met. Download a complimentary copy of our eBook now to learn more about the IoT and its role in what has become known as the Fourth Industrial Revolution, also called Industry 4.0. Or contact Strategic Systems Group, your one-stop shop for manufacturing ERP. Call 310.539.4645 or email us at info@ssgnet.com.